In the Highlands of Roan, Southern Appalachian Highlands Conservancy convenes a multi-partner effort to manage the world’s largest stretch of Appalachian grassy balds. These unique ecosystems contain a variety of rare plants. SAHC volunteers and our partners with the NC BRIDGE program contributed more than 1,900 hours to manage habitat on Roan’s grassy balds this summer. 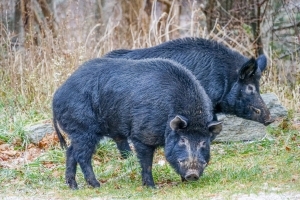 Altogether, Roan stewardship partners managed a record 32 acres. Volunteers and BRIDGE partners hand-mowed more than 17 acres from Round Bald to Grassy Ridge, cutting back blackberry and shrubs across the balds. 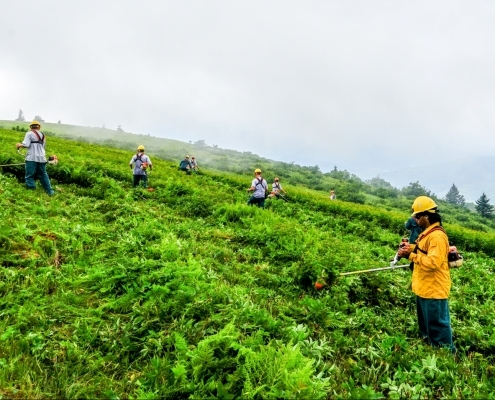 The US Forest Service mechanically mowed 15 acres on Hump Mountain. The BRIDGE crew are hardworking stewardship partners. A program of the NC Division of Prisons the NC Division of Forest Resources to train young, non-violent offenders with firefighting and forestry skills, BRIDGE stands for “BUILDING, REHABILITATING, INSTRUCTING, DEVELOPING, GROWING, EMPLOYING. Our Roan stewardship work is supported by grants from the National Forest Foundation, McLendon Family Foundation and the Appalachian Trail Conservancy. Thank you to all the volunteers, partners, and supporters who make this work possible! The Roan Highlands are home to grassy balds, rhododendron gardens, high-elevation rock outcrops, and rich spruce-fir forests. The Roan’s ecosystem is one of the richest repositories of temperate zone biodiversity on earth, including more federally listed plant species than the Great Smoky Mountains National Park. The Roan Highlands are home to more than 800 plant species and over 188 bird species. This summer, Stanback Intern Sarah Sanford from Duke University’s Nicholas School of the Environment created a Story Map of Grassy Balds management, using GIS data to catalog three decades of habitat management in the Highlands of Roan. Enjoy a virtual journey to the Roan through historic photos, scenic images, and interactive maps below — or feel free to visit and share the Story Map with this link.